If you have been following along, then you might be familiar with most of this amazing story: How former UNLV soccer star Simon Keith has become the world’s longest-surviving heart transplant recipient; how, after refusing to be defined by his condition for more than 25 years, he finally has come to grips with it and embraces it; how he has started a foundation to raise awareness for organ donation; and, now, how he finally has written the book that had been bouncing around inside his head for more than 25 years, like a soccer ball at one of those games played indoors on a hockey rink. 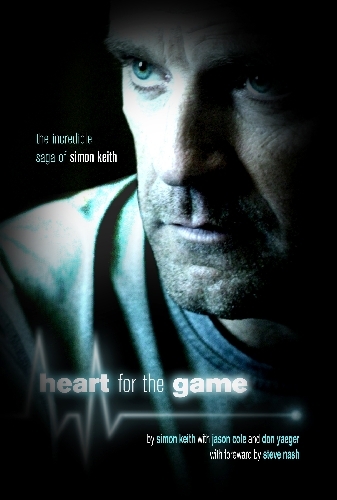 But to finally finish that book, appropriately called “Heart for the Game,” Keith first had to write the last chapter, which, as so often happens in the publishing business, became the first chapter in the book. He had to visit Wales, in the United Kingdom – where his father was born – to meet the loved ones of a young man who, like him, had been a young soccer phenom; who, like him, was born with a defective vital organ. This young man had an aneurysm that ruptured – right there on the soccer pitch – filling his brain with blood. This was the young man who had to die so Simon Keith could live. Nothing can prepare one for a journey such as this. There is no manual, no advice, nothing you can look up on Wikipedia. So you just go with your gut. You let emotions be your guide and, well, what’s in your heart. You bring Kleenex. You bring lots of Kleenex. “Something inside me said, ‘I’ve got to go do this, and I’ve gotta go do this now,’ ” said Keith, who received the second gift of life on July 7, 1986, and was the first heart transplant recipient to play professional sports after being drafted first overall by the Cleveland Crunch of the Major Indoor Soccer League in 1989. We were sitting in a pub in Town Square, and it was a beautiful day, and the windows in the pub were opened to the street, to let in the sunshine and a slight breeze. And it was delightful, one of those days that makes you glad you’re alive. That’s exactly what I was thinking, though I kept it to myself, because, I don’t know, it didn’t seem like the right thing to say to a guy who has been through what Simon Keith has been through. “That dude right there,” he said, gesturing, as if he still can see the headstone, “is the reason all these people are here. I’m here, alive, and I’ve got his heart, and his dad is standing right there, and what do you say, what do you say at that moment? And so it was that on a warm summer day in August, 46-year-old Simon Keith and his family found themselves standing in this cemetery in Wales, not far from this soccer pitch in Wales, where 17-year-old James Fields (not his real name, because James’ loved ones deserve their privacy, too) had died, so he could live. James’ father, Robert, had shown Simon faded photographs of his son. James Fields had red hair and freckles. Simon turned to where his son and daughter, Sean and Samantha, were standing solemnly, teenage arm locked in teenage arm. Sean Keith has red hair and freckles, too. There was guarded reflection and visible emotion, and there was this big picture that Simon Keith now was seeing in crisp focus and amazing detail for the first time. There were tears. There was an attempt at a small joke, to lighten the mood. Then there were more tears, more guarded reflection, more visible emotion. And as her father stood in deep thought, Samantha Keith took a wildflower she had plucked from the Welsh hillside and placed it on the young man’s grave. For more information about becoming an organ donor, visit the Simon Keith Foundation.